Mr. Delibes was often Spain’s leading nominee for the Nobel Prize in Literature. Known for his humble nature, his empathy for the poor and a lifelong commitment to rural Spain and its traditions, he wrote of sheepherders, cheese-makers, blacksmiths and hunters. 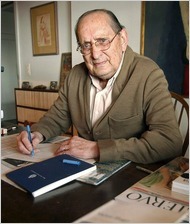 His characters are complex, often reflecting the cultural and political struggles that followed the Spanish Civil War.